Husband invested some time and money researching rechargeable batteries when the twins were born. We actually got double A rechargeable batteries that fit into size C or D casings that we also purchased - perfect for swings and later for 3+ age toys. In the last couple of months I noticed that I couldn't get the batteries to recharge. We had to throw some out. That is pretty much how I felt too. No ability to recharge. Three kids, a job to go back to looming quickly, then femur break and spica cast resulting in a child demon who whines 24-7 I really, really needed a break. Fortunately pre-spica cast we had already arranged for my in-laws to fly in (yeah, benefit to Husband's weekly travel) and watch the kids for a couple of nights while we got away. 1. We picked a close destination. Portsmouth, NH. We drove the minivan and our small car to Manchester and gave the minivan to our inlaws (complete with GPS to get them to our house). No flights to chase after, no concern when in-laws flight was delayed for de-icing. 2. We went during weeknights. Having Nanny April there when we left on Thursday morning and with us returning Saturday morning (we were home by 11 am). My mom agreed to help with bedtime Thursday night and the nanny stayed a little late on Friday. I felt less guilty by having the kids' regular schedule in place. I can say this with complete honesty - this was the best weekend away I have ever had. First of all, no blackberry. I am still on leave (extended until Jan 31 for Ned's rehab) so I wasn't checking in all the time with work. Second of all, I planned some amazing meals out but other than that the only other item on our agenda - SLEEP. Glorious, uninterrupted sleep. Waking up not because the kids force us to at 6 am but because we were hungry and wanted breakfast. Have I mentioned sleep? We stayed at the Hilton for free (again, Husband travel) so that was great - we were in the downtown so walked most everywhere. We arrived around lunch time on Thursday, stopping at Gilley's PM Lunch for an incredible burger (I rejected fries in favor of a second burger it was that good). Not quite ready for my scheduled nap we went to the Portsmouth Brewery for a beer. I ended up having two, we met a lovely traveling salesman (fancy foods) and had a private tour of the tiny brewery. Although not sampled the curried mussels looked amazing and were told that the fish sandwich is their specialty. Nap, glorious nap. It was hard to rouse ourselves but we had dinner reservations at the Black Trumpet which was highly recommended from friends and Trip Advisor. It was great and even in jeans/sneakers I didn't feel out of place despite it being a sort of upscale wine bar. We split some amazing mussels in a beer broth and I had gumpo and Husband had fish stew - definitely a cozy sort of night. Then we hit up the Green Monkey for a drink - that was served with a little hanging monkey of course! The next morning I dragged Husband to the Friendly Toast which had the most amazing breakfast potatoes. Then we window shopped and watched the worst movie ever (How Do You Know - do not go to it). We had early dinner reservations at Cava for our very early anniversary celebration. When I called for reservations I was told that they only have them for the Chef's Table (basically a counter at the kitchen) and I thought that sounded fun. It was amazing. The couple next to us was clearly just dating so asked no questions but Husband and I asked the Chef (who was young and cute, FYI) a ton. The food was amazing (if pricey) and we went back for a couple other options after we did the chef's tasting menu (we were torn between potatas bravas and the gnocci as our favorites). Desert wasn't so great but it was included in our tasting menu. I only passed on the scallops after one small bit (I cannot force myself to like it despite repeated tastings). I was all for going to bed early so I wouldn't be hung over the next day but Husband thought one more drink sounded fun. We went to the Dolphin Striker which had live music scheduled. The Bobby Keyes Trio was quite good (sort of jazz/blues) but took forever to get set up and I fully admit I drank too much. It was probably the worst decision of the trip (including our awful movie). We had free breakfast in the hotel - if I hadn't been hung over I probably would have forced Husband back to Friendly Toast. Portsmouth is an interesting town. It is conservative and very white. But they are big into being local without a lot of crunch granola feeling that can come along with that sentiment. Unlike Newport (last year's trip), it didn't feel empty on the off-season, just quieter. I really liked it and would love to go back. I highly recommend the paces we dined at and I am so happy we have a nice memory of this trip (if no photos since I forgot a camera). We may continue to try to get away every December or at least early January for a couple of nights. 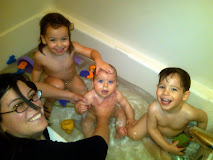 Sometimes having three kids makes this seem insurmountable but it also makes it completely worthwhile. Special thanks to Bill and Debi, Nanny April and my mom Susan for helping out in our absence. How do you recharge yourselves and/or your marriage? Sounds so awesome! The closest we had to a weekend like this was our trip to New Orleans for a my friend's wedding. It was so great to sleep in and just do whatever we wnated without any schedule or routine to worry about. A closer trip is def the way to go though, I think. You get so much more down time. I really wnat to go to Montreal for our 5th anniversary/my 30th birthday but I wonder if its too far... And Billy needs a visa! Good for you for getting away. Was going to comment on how astonishingly smiley Ned and everyone was seeming in pictures in last post, but I guess it is hardly surprising if there is a bit (a lot) of whining too, poor fellow. I like this analogy and am so glad you got away! Hopefully you will laugh about this whole cast thing in a few years. My MIL arrives tomorrow so recharging time will happen soon! We did something similar in August and I have to say it was probably one of the best weekends away! I loved it because we actually just got to be together, talk interrupted, sleep, go with our own schedule. I have to schedule another one - wish it could be sooner rather than later. Glad you had a good time! Before we had kids we would do this all the time ... but after the kids we realised what a gorgeous respite it was. Your trip sounds fantastic - good food and great fun. Thanks for sharing. PS Going somewhere close is the key I reckon. Wow, that sounds awesome! Particularly the delicious food, and even more delicious sleep. YES!! Ever since the boys were 2, my mom has offered a 24-hr getaway, near our anniversary. We've been to Newport, Foxwoods, even Boston for an overnight. For our 10 year, we had my cousin babysit the boys for a 48 hr getaway. There is nothing better!! Glad to hear you got a chance to go away and recharge!! You guys deserve it! What a fabulous trip...it's funny what your fantasy vacation becomes once you have little ones. We have 10 month old twins who do NOT sleep through the night and my ultimate dream is to SLEEP....and the good food cooked my someone else is the cherry on top.